very fine, sheer, lightweight silk fabric, which is one-colour or printed; in linen weave with a characteristic crepe surface. Produced from natural silk or viscose rayon. In the weft is a crepe yarn with S and Z twisting of a 2:2 throwing ratio. 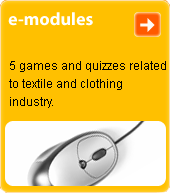 Fashionable types of c. are produced from acetate, triacetate or (most commonly) polyester silk. Used for ladies' lightweight dresses, blouses, shawls and headscarves.